The following pesticide products have received state registration to meet a Special Local Need (SLN). To use these products for the special local need, legally you must have a copy of the Ohio 24(c) supplemental label. Copies of these labels are available to download below. Click on the SLN # to view a copy of the labels. OH150002 Hero Insecticide FMC Corporation For control of pests on turnip greens. OH140002 Aim EC Herbicide FMC Corporation For weed control on hops. OH130004 Spartan Charge Herbicide FMC Corporation For use in Ohio on peppers. OH120001 Roper DF Rainshield Loveland For control of tobacco plant bed and field diseases in tobacco (Burley). OH110007 Spartan 4F Herbicide FMC Corporation For use in Ohio on strawberries. OH110006 Terramaster 4EC Chemtura For pythium root rot control in tobacco. OH110005 Ridomil Gold SL Syngenta For use in tobacco transplant water for control of black shank. OH110004 Quadris Flowable Fungicide Syngenta For target spot control for tobacco transplants in the greenhouse. OH110003 Instinct Dow AgroSciences For postplant application in corn. OH110002 Dual Magnum Syngenta For weed control in fruit and vegetable crops. OH11001 Indar 2F Dow AgroSciences For control of blossom blights and fruit brown rot in cherries, peaches and nectarines. OH080003 Manzate Pro-Stick Fungicide United Phosphorus, Inc. For control of tobacco disease in tobacco. OH080002 TREE-age Syngenta For control of Emerald Ash Borer in Ash Trees, Tree injection only. OH080001 Mustang Max EC Insecticide FMC Corporation For use on sugar beets for the control of wireworms, white grubs, cutworm species, flea beetles, and grasshoppers. OH070003 Diazinon AG500 Makhteshim Agan For suppression of wireworms and control of cutworms in potatoes. OH070001 Merit 2F Bayer For control of emerald ash borer. 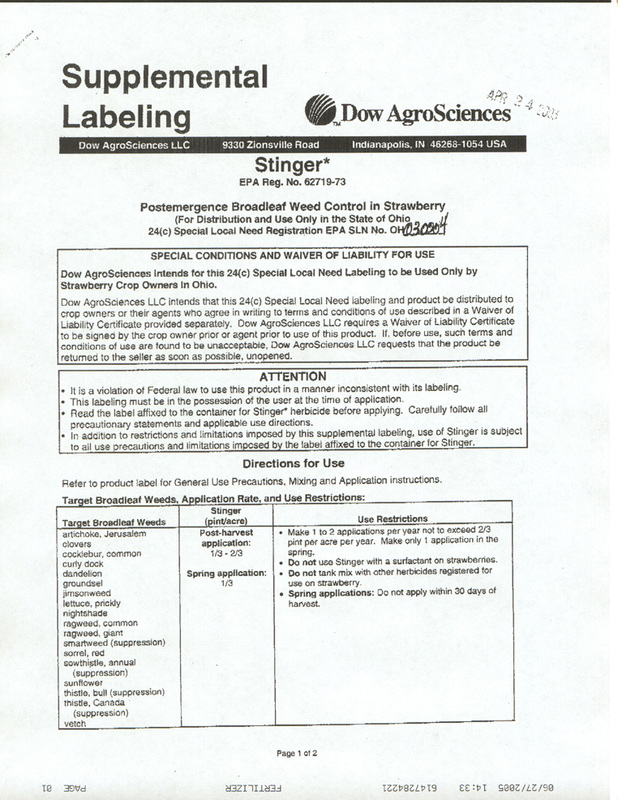 OH030004 (p. 2) Stinger Dow AgroSciences For postemergence broadleaf weed control in strawberry. OH030002 Mustang Max FMC Corp. For use on sugar beets to control seedling pests: wireworm, white grub and cutworms species; to control foliar pests: cutworms species, flea beetle and grasshopper. OH020006 Dithane DF Dow AgroSciences LLC For control of tobacco plant bed and field diseases in tobacco (Burley). OH020003 SureguardTm WDG Valent USA For control of annual weeds in conifer trees. OH010003 SureguardTm Valent USA For control of annual weeds in deciduous trees. OH00006 Orthene 97 Valent USA Control insects on ornamentals. OH970007 Orthene Turf, Tree & Ornamental WSP Valent For application as soil injection for aphids and spider mites. OH970006 Orthene Turf, Tree & Orn. Spray (59639-26) Valent USA For application as soil injection. OH950001 Captan 50 WP Arysta LifeScience Raspberries and blackberries to control cane and fruit diseases. OH790008 Monitor 4 (3125-280) Bayer Control various insects only on fresh market tomatoes.